English Language Learners (ELLs) are the fastest- growing student population. 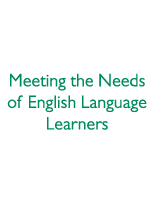 These sessions help teachers support ELLs and meet Common Core State Standards. Learn research-based strategies and sound pedagogical practices for English language development. Recognize language proficiency levels, review language acquisition theory, and discover how to facilitate language learning. Build on cultural and equity assumptions to motivate ELLs.